Authors trained parakeets to go through a gap and then changed the widths to see the what happened. If the gap was narrower than their wingspan the birds would adjust their position when going though the gap. When birds fly in cluttered environments, they must tailor their flight to the gaps that they traverse. 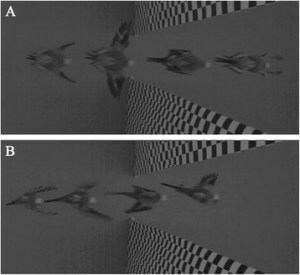 We trained budgerigars, Melopsittacus undulatus, to fly through a vertically oriented gap of variable width, to investigate their ability to perform evasive manoeuvres during passage.